Heritage Grand is a 55 and over neighborhood situated in the master-planned Cinco Ranch community in Katy, Texas. Both communities take pride in their well-maintained boulevards, trees, flowers, and grass. Winding walkways and biking paths foster a pedestrian-friendly environment. This suburban community has an equally beautiful and convenient location. Residents are close to all forms of shopping, every kind of medical service, as well as parks and golf courses. Heritage Grand at Cinco Ranch is comprised of 552 single-family and 98 duplex homes. With boundless indoor and outdoor amenities, Heritage Grand at Cinco Ranch is an ideal community with beautiful homes in the Houston area for today's active adult homebuyer. The 14,000 square-foot Heritage Grand clubhouse has a staff of five full-time assistants to ensure the smooth process of the large array of activities. Residents can utilize the fitness center on an individual basis at their convenience.The clubhouse ballroom lends itself very well to the social events that take place regularly at Heritage Grand. These functions include line dancing, weekly coffee socials, weekly pot lucks, fashion shows, craft shows, and monthly breakfasts. Residents also have use of a library, a computer room, and two billiard tables. Outdoors, the clubhouse provides horseshoe pits, bocce ball, shuffleboard, and basketball courts. Residents also enjoy a large pool with lap lanes and counter flow exercise circle plus a large spa. Cinco Ranch is home to an 18-hole premier championship golf course designed by Carlton Gibson. This 72-par course is open to Heritage Grand residents as well as non-residents. The 650 homes at Heritage Grand at Cinco Ranch were built between 2002 and 2010. Village Builders is the main builder within Heritage Grand at Cinco Ranch, but 65 of the homes were constructed by K. Hovnanian as well. There are 26 different models for the single-family homes and two duplex models. The single-family homes are either all-brick or mostly brick with a small amount of concrete board and offer between 1,561 and 2,996 square feet of living space. The duplexes are mostly concrete board and have either 1,611 square feet or 1,896 square feet if the optional loft is added, which includes an additional bedroom and bathroom. All homes in Heritage Grand at Cinco Ranch have two or three bedrooms, gas heat, electric air-conditioning, master bedrooms on the first floors, monitored alarm systems, and sprinklers. Energy-efficient features include dual-pane windows, poly seal insulation at windows, and programmable thermostats. Most residences have two-car garages while some have three-car garages. Homes have two to three-and-a-half baths and are mostly single-story designs. All homes also feature fenced-in back yards providing great privacy. Heritage Grand at Cinco Ranch was especially built for those over 55 whose focus is on an active lifestyle. All events are updated weekly on a web broadcast and are also published in the community newspaper on a monthly basis. Regular activities at the fitness center include yoga, water aerobics and other exercise classes. Safety, beauty, and convenience come together in this gated community for an atmosphere of the good life. The surroundings are clean and attractive and many residents enjoy pleasant walks and bike rides throughout the neighborhood. There are many organized field trips and other events by the on-site activity staff and residents are active in a large variety of social groups. These include book club, writers club, crafters club, garden club, and dining club. 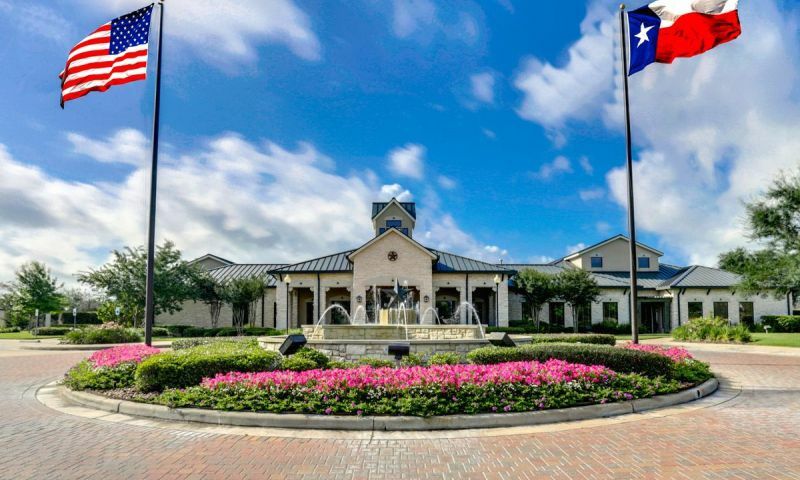 Heritage Grand at Cinco Ranch in Katy, Texas is located in a fast growing area, approximately 28 miles west of the center city in Houston. Residents are only a few miles from I-10 and I-99, making it easy to explore the surrounding area. Supermarkets, drug stores, outdoor shopping centers, and big box stores are all close by. La Centerra shopping center is just down the street and provides a wide variety of retail stores, restaurants, and other business offices. There are also a gas stations, fire stations and CVS conveinently located down the street from the community. The area also includes several major hospitals such as Memorial Hermann, Christus St. Josephs, and Methodist. Popular attractions in the area include Med Arts Center, Heritage Society, Visual and Performing Arts Center, River Oaks Chamber Orchestra, and Westside Recreation Center. Besides Houston, other cities in the area worth a visit include Sugar Land, Galveston, and Pasadena. With a bustling surrounding area, desirable homes and plentiful amenities it is easy to see why active adults are flocking to Heritage Grand at Cinco Ranch in Katy, TX. Clubhouse - 14,000 Sq. Ft. There are plenty of activities available in Heritage Grand at Cinco Ranch. Here is a sample of some of the clubs, activities and classes offered here. There 98 duplexes in Heritage Grand at Cinco Ranch. The Chesapeake and Potomac models range from 1,611 to 18,65 square feet and offer an optional loft. These low-maintenance homes feature two bedrooms, two to three bathrooms and a two-car garage. The Garden Collection models by Village Builders includes six floor plans available at a reasonable price. Homes range in size from 1,553 to 2,096 square feet and feature two to three bedrooms, two bathrooms and an attached two-car garage. The Veranda Collection by Village Builders consisted of seven single-family home models between 1,949 and 2,754 square feet. Homes feature two to three bedrooms, two to three-and-a-half bathrooms, and a two to two-and-a-half-car garage. The Courtyard Collection homes were the largest single-family homes offered by Village Builders. Homes in this collection range in size from 2,500 to 3,030 square feet and feature three bedrooms, plus a den, two-and-a-half to three-and-a-half bathrooms and a two-car garage. K. Hovnanian constructed 65 of the single-family homes in Heritage Grand at Cinco Ranch. These models were available in eight floor plans that ranged from 1,520 to 2,391 square feet. Homes feature two to three bedrooms, two to three bathrooms, and an attached two-car garage. Very nice homes in an area that has a lot of shopping and local restaurants close by. Highly recommend it. I moved here this spring and it didn't take long for me to meet lots of new people who really helped me get involved with the community and make some new friends. I like to play poker, billiards, bowl, etc. I have a lot of fun here and it's been great meeting so many guys just like me, and of course the ladies too! As the previous person mentioned, nearly everything is included or taken care of by the community so you just move in and enjoy. A former neighbor recommended Heritage Grand to us in 2006 so we drove out to take a look. 4 Months later we had a deposit down and began construction (new). We moved into our new home in Nov 2007 and have loved it ever since. Literally everything's included (cable, lawn mtce, alarm system monitoring, fence mtce, etc. We love being so close to a new HEB, Home Depot, nearby hospital and living only 2 miles from the Westpark Tollway. Katy, TX is definitely is where it's at and if your 55 or over, Heritage Grand is the place to live. 55places.com is not affiliated with the developer(s) or homeowners association of Heritage Grand at Cinco Ranch. The information you submit is distributed to a 55places.com Partner Agent, who is a licensed real estate agent. The information regarding Heritage Grand at Cinco Ranch has not been verified or approved by the developer or homeowners association. Please verify all information prior to purchasing. 55places.com is not responsible for any errors regarding the information displayed on this website.